Previously, I covered how to find the intersections between two bezier curves and gave a conceptual overview of how to perform boolean operations on bezier paths. In this final installment I’ll present the algorithm used to implement the boolean operations. The algorithm that I show here is based on the algorithm presented in “Efficient clipping of arbitrary polygons” by Günther Greiner and Kai Hormann. My algorithm is adapted to work on closed bezier paths (instead of polygons), handle nonintersecting (sub)paths, and handle intersections between fill paths and hole paths. As before the full source code is available on Bitbucket, and it’s licensed under the MIT license. If you want to follow along, the majority of the algorithms described are implemented in the FBBezierGraph class. My algorithm, like Greiner-Hormann’s, uses several data structures. 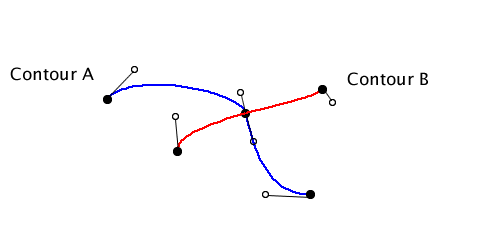 The primary is FBBezierGraph. Think of FBBezierGraph as an expanded version of NSBezierPath that can be annotated with where intersections happen. FBBezierGraph contains FBBezierContours, which are just closed subpaths. Anytime I see a moveto in a NSBezierPath, that’s a new contour. FBBezierContours in turn contain FBContourEdges, which are mainly wrappers around a FBBezierCurve. They represent one cubic bezier curve, and can also hold FBEdgeCrossings. Each FBEdgeCrossing represents a location where another edge crosses this edge. By breaking a NSBezierPath out into all these separate structures, it makes it easier to process. Contours need to be dealt with one at a time, and I need a way to keep track of where the intersections happen. The basic flow is to convert my NSBezierPath into a FBBezierGraph, perform the boolean operation, then convert it back to a NSBezierPath. FBBezierGraph handles both sides of the conversion. Find all the intersections where the edges actually cross, and insert FBEdgeCrossings into both FBBezierGraphs at those locations. Handle all the intersecting contours. Walk each contour and mark the entry and exit into the section I want to output to the final result. Walk each contour and output the final contours by following the entry and exit directions marked in the previous step. Handle all the nonintersecting contours. Step three is the only step that is very different between the operations. Step two is identical except for if we mark the inside or outside section. As I’ve mentioned previously, exclusive or is implemented in terms of union, intersect and difference. I’ll now ignore exclusive or for the rest of the post. For all three operations I start the same way: finding all the intersections where the edges cross. I do this by simply walking each edge of the subject bezier graph and intersecting them with the edges of the clipping graph. I don’t look for self intersections. I insert a FBEdgeCrossing into each bezier graph for each intersection, and point the crossings at each other so I can easily jump between graphs at crossings. You can find the code for this in the insertCrossingsWithBezierGraph: method. There are a couple of things I have to look out for when determining if two edges actually cross at an intersection. One possibility is that the two edges are tangent at the intersection, and don’t cross. That is straightforward to detect; I compute the tangent for both curves at the intersection point, and see if they’re parallel. If they are, then they are tangent at that point. I then compute the angles of the tangents by computing the polar coordinates. 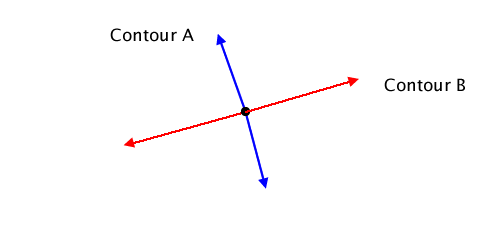 If the contours cross, the angles will cross as well. The method doesEdge:crossEdge:atIntersection: implements the crossing check. When finding crossings I have to be wary of one additional problem caused by intersections at end points. 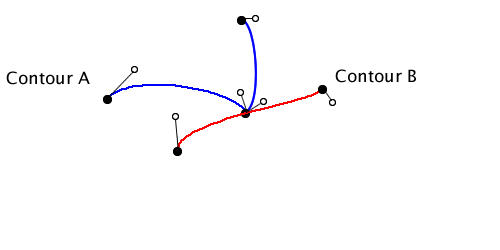 Since the end of one edge is the start of the next, an intersection at the end point will be found on both edges, resulting in duplicate crossings. So when I’m done finding all the crossings, I’ll go through the crossings I found and remove the duplicates. This is the code from the union operation. 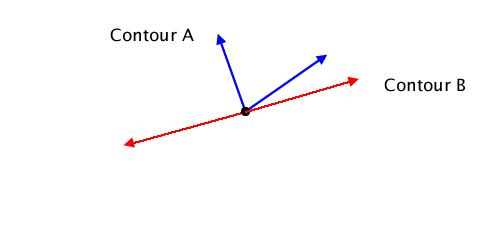 The code for the intersect and difference operations are identical except for the values passed in to the markInside parameter. Intersect passes YES for both self and graph, while difference passes NO for self and YES for graph (marking the outside of self and inside of graph). Above I check to see if the other contour I’m intersecting with is a hole or not. As I talked about in the previous post, if the other contour is a hole, then I want to mark the opposite section that I normally would for this operation. I pick a point on the contour to start with. I determine if the point lies inside or outside the other contour, using the even odd rule. Using the markInside parameter and if the start point is inside or outside, I determine if the start point is in the section I want to output or not. If the start point is in the right section already, the next crossing will be an exit, so assign isNextCrossingAnEntry = NO. If the start point is not in the section I want to output, the next crossing will be an entry, so I assign isNextCrossingAnEntry = YES. Assign the crossing’s property isEntry = isNextCrossingAnEntry. Toggle the value of isNextCrossingAnEntry. The only tricky part of this is choosing a good start point. I don’t want a start point that is ambiguous, like one that is on the other contour. I find the first unprocessed crossing on the bezier graph. I create a new contour. If the crossing is an entry, I move forward through the contour adding the edges (or edge segment if there’s a crossing) until I encounter the next crossing. Else the crossing is an exit, and I move backwards through the contour, adding edges (or segments) until I encounter the next crossing. I switch to the other bezier graph by setting the current crossing to it’s counterpart. I add the new contour to the final bezier graph. And now I’m done processing all the intersecting contours. 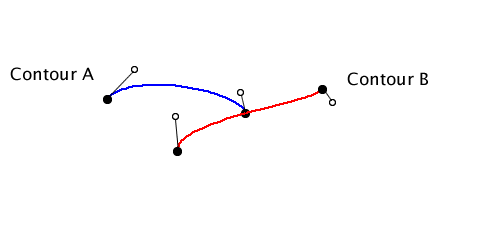 The final part of a boolean operation is dealing with the nonintersecting contours. This is where the various boolean operations differ the most. I start with the list of contours that don’t intersect anything. For the union operation, I start out optimistically and assume they’ll all end up in the final result. I then walk both bezier graph’s nonintersecting contours and see if an individual contour is inside (as defined by the even odd rule) the opposite bezier graph. If it is, I know it’s redundant and I remove it from the final contours. Intersect is more or less the opposite of union. I start by assuming none of the nonintersecting contours from either bezier graph will make it. I then walk all the nonintersecting contours and see if the opposite bezier graph contains them. If the opposite graph does, then there is overlap, and the overlap is the contour being contained. I start computing the difference for nonintersecting contours by assuming none will make it into the final result. I then walk the nonintersecting contours for the subject bezier graph. If they are not contained by (and thus not subtracted away) the clipping bezier graph, I add them to the final contours. 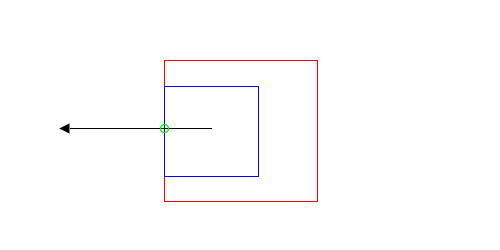 Next I walk the nonintersecting contours for the clipping bezier graph. If they are contained by the subject bezier graph, that means they cut a hole in the subject, so I add them to final contours. And with that I’m done. 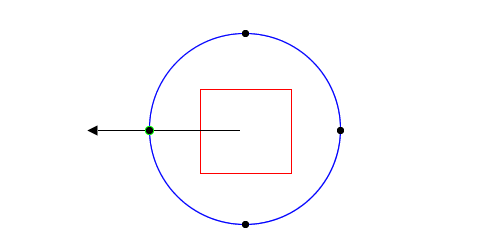 I have the final intersecting and nonintersecting contours and can convert the bezier graph back into a NSBezierPath. In the previous section, I skipped over the implementation of the containsContour: method despite the fact it gave me fits in practice. In theory it should be easy to implement: I pick a point on the contour and use the even odd rule to see if the point is inside the other bezier graph or not. Unfortunately there are two situations which make it not as simple as I’d hoped. Does the blue contour contain the red? In both cases the even odd rule returns one intersection, indicating that it does. However, just by looking at it, I can tell that in the diagram on the right, it doesn’t. The problem is the ray passes through an edge where both contours coincide. This one is a bit more subtle. Notice that the ray I’m using to determine even or odd intersects where two edges meet. This means I’ll find two intersections (one for each edge) instead of just one, and I’ll think the red square is outside the blue circle. My solution is somewhat brute force. I actually ended up casting a full line through the entire contour, instead of just one side, in order to increase my chances of getting a useful ray. I also alternate between horizontal and vertical lines, and I loop until I get a line that is unambiguous. There is more code dedicated to this operation that I like. There is probably a better way to do this. I took on this project mainly for my own benefit, so I could learn how this works. But hopefully you’ve learned something useful too amidst all my struggling with this. I have tried to test the sample code the best I could. You can check out all the test cases under the “Shapes” menu in the sample application. However, I’ve undoubtedly missed or left out edge cases which will cause the code to fail. If you decide to use this code in a commercial application: test, test, test. If you do find a case my code doesn’t handle, I’d like to hear about. That said, the code is provided as is, and I’m not guaranteeing any support for it.